Arcane Enchanters are workbenches where Enchanting can be done. New enchanted items can be created, or existing items can be broken down, allowing you to learn any new magical effects used in the item's enchantment. How an Arcane Enchanter is used is described on the Enchanting page. 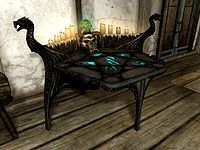 A category listing places where enchanters can be found is available at Skyrim-Places-Arcane Enchanters. This page was last modified on 7 September 2018, at 21:45.